Simple, small and surreptitious is in fashion when it comes to houses as dwellers begin to live more eco-conscious and sustainable lives. 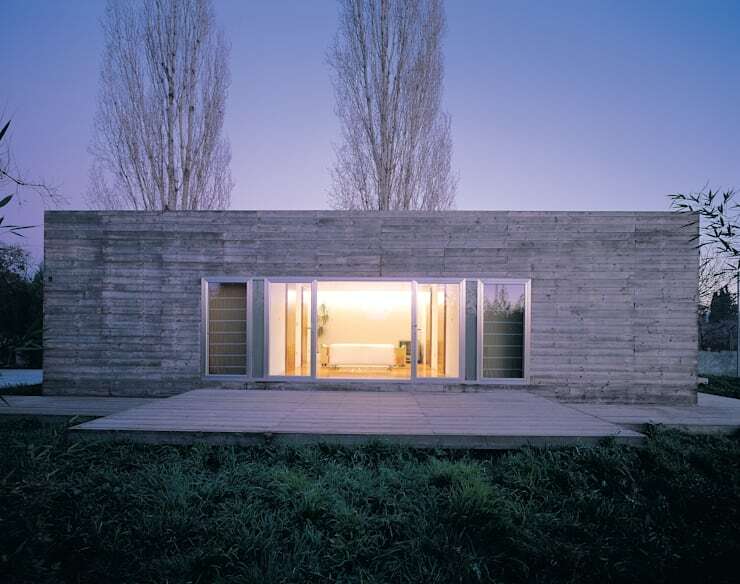 This beautiful shed house by Martin Martin Architects is no exception. The Spanish architect knows how to use clean lines, simple designs, space and natural tones to create a modern masterpiece. A basic shed house can become a beautiful home, showing that size doesn't necessarily matter when it comes to design. 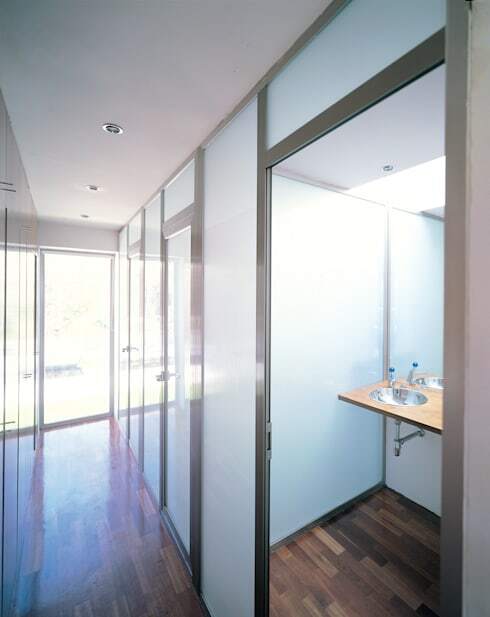 What's more is that a minimalist style can complement the beautiful, natural surrounds of a property. Martin Martin Architects have mirrored the simple design of the outside of the house inside, keeping a bare necessities approach throughout. Follow us as we explore this shed house from the outside in. Viewing the shed house from the front angle illustrates how effective the design truly is. These architects have taken the vertical space and created something stylish, homely and warm. Earthy tones, wide glass doors and windows and a large patio work together to position the house in its natural surrounds where trees and lush grass are just as much as a part of the design as the bricks, mortar and architecture. 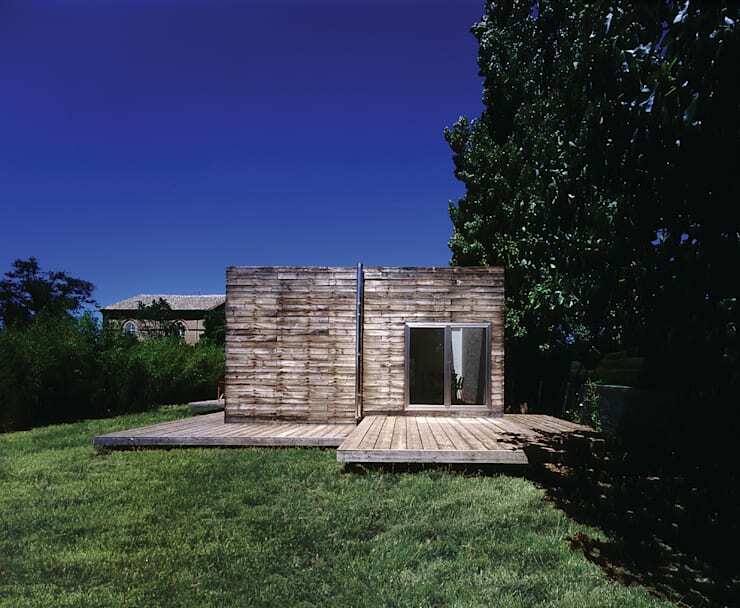 A small shed house collides with a modern, comfortable home, set in the beauty of the nature around it. From the side, it is clear to see the shape of the shed house and the consistent design throughout the structure. This angle also gives a clear view of the lush and beautiful grass, trees and shrubbery and how naturally the warm colours and design of the house blend into the surrounds. Glass doors lead out onto the large patio that surrounds the home, making the outside of the house just as accessible as the inside. This is because the outside of the house plays as much as a role as the inside, working together in harmony to create the perfect design. Simple patio furniture complements the purpose of the shed house, which is to incorporate the outside elements. The architects have utilised the warm, natural tones for the furniture and have gone with the minimalist style. With Martin Martin Architects, less is more. This view also shows how wood is a key player in the design, blending in with the natural elements surrounding it. The tan, beige and brown colours work with the deep emerald greens of the trees and the grass, creating a wonderful, overall effect. Being outside, enjoying nature and the sunshine, isn't complete without a swimming pool. 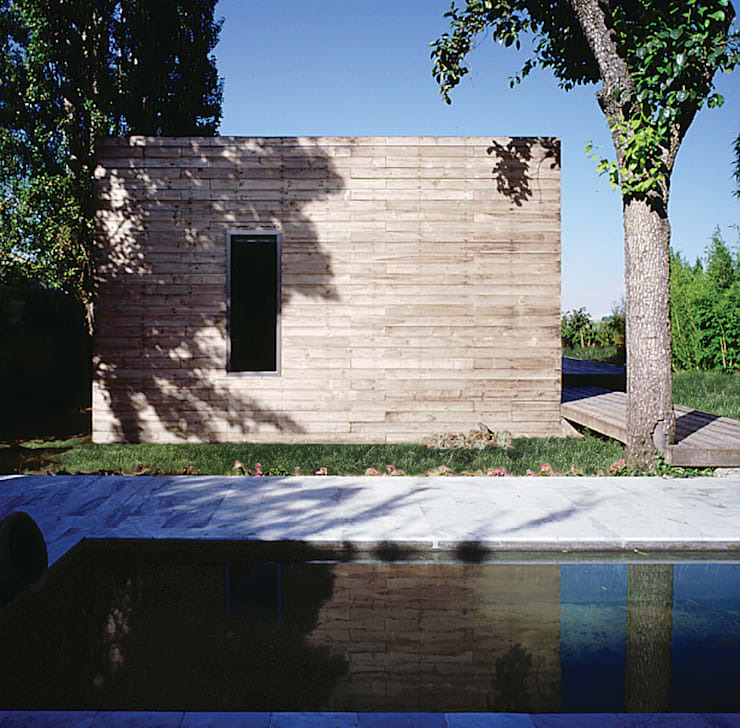 The black liner inside the swimming pool helps to absorb heat, making this a functional addition to the shed house. Afternoons can be spent doing laps in the warm water or picnicking on the grass. The swimming pool is surrounded by large, beige slabs that work with the rest of the design. The architects have also created a large pool, making the most of the size of the property, which offsets the size of the neat, small shed house. The modern aspects of this home are not overlooked in any small detail. Light, neutral colours are used throughout with clean lines and modern finishes. Going inside this home is as pleasurable as being outside. The darker wooden floors keep the warm, cosy atmosphere alive inside the home as well as maintain the natural look and feel of the entire design. Every detail has been thought through, ensuring that comfort and style are equally key. The open plan kitchen overlooks the beautiful, rolling lawns, through the large, glass doors. This also lets in an abundance of light. The kitchen is designed perfectly for the home, sized appropriately with modern, classic finishes. The architects have taken into account the inhabitants of the shed house with long, Sunday lunches and early morning breakfasts in mind, creating a comfortable cooking and eating space with a view. Wood is a strong theme throughout the interior of the home as is the minimalist theme, offset by the clean, white colour. Only absolutely necessary furniture pieces are used in the home, avoiding clutter and complexity. Because the shed house is limited in terms of size, this creates the impression of space inside. 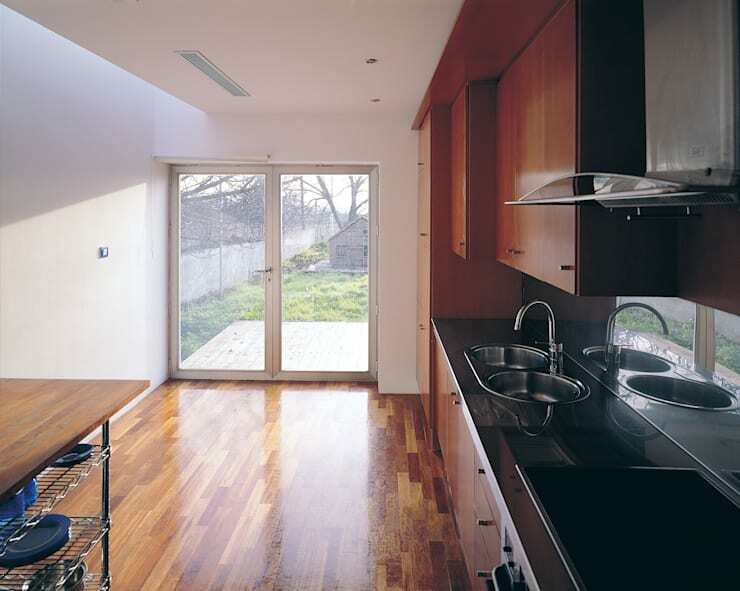 Natural light is also utilised throughout the home, keeping within the theme of incorporating the nature surrounding it. 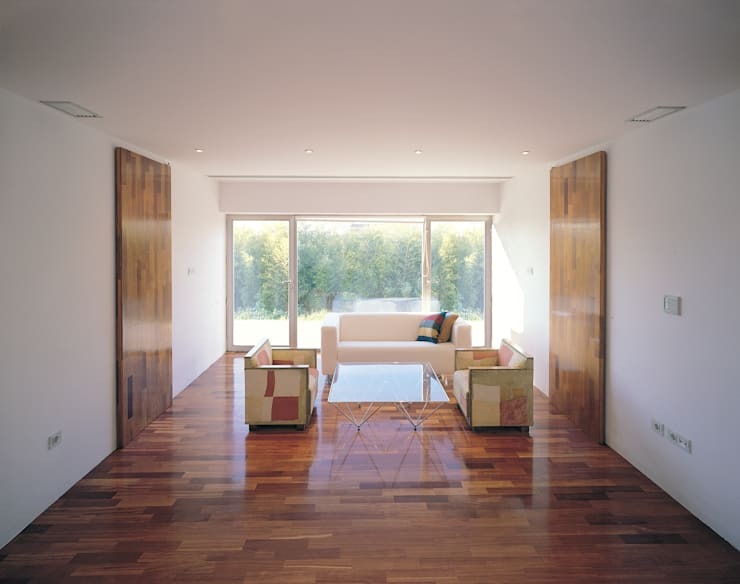 Natural light also creates the impression of a bigger space inside the home, lightening and brightening the shed house. 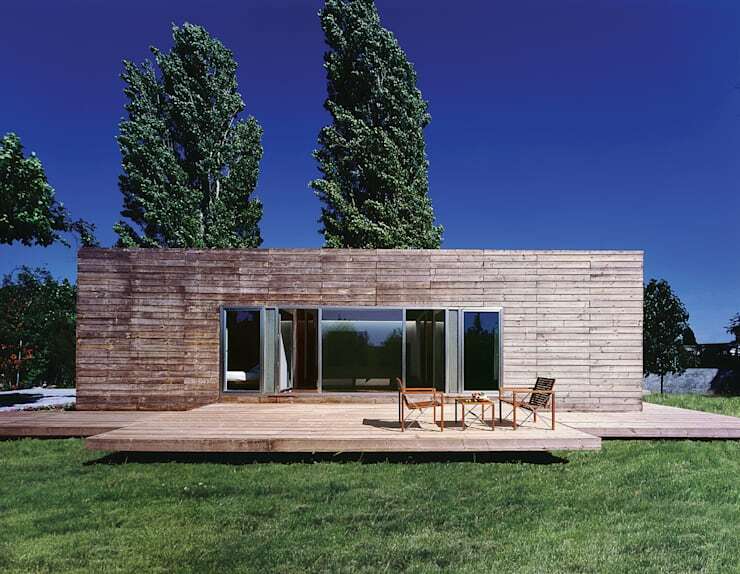 To explore another wonderful contemporary home, check out: The Ultimate Contemporary Wooden Home. Are you a fan of contemporary architecture? Let us know in the comments, below.